Skip the Christmas tree lot this weekend and head to your local nursery for the ultimate eco-friendly tree. 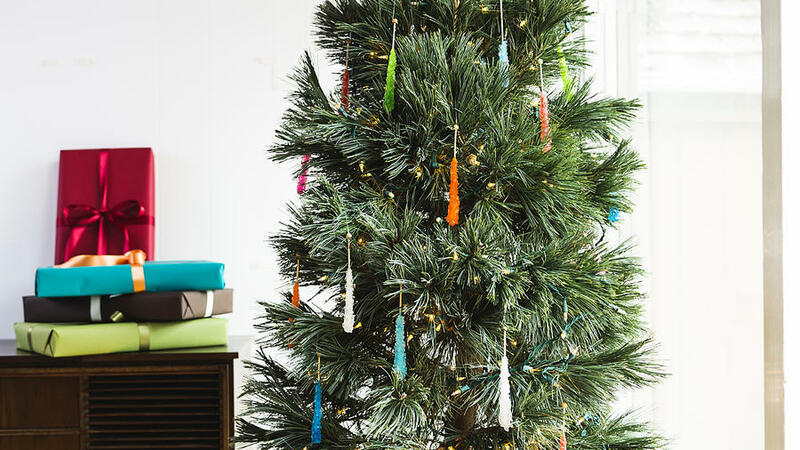 For first-time success with a container conifer, follow our tips for keeping your living tree healthy through Christmas Eve and for years to come. Whether or not you’re keen on going green, getting a potted Christmas tree can make a lot of sense. You only need to purchase a tree once and you’ll be set with a tree to bring in for the holidays for years. Plus, once the fella gets too big, you have a great addition to your garden that can bring back memories of Christmases past. Caring for a living tree is relatively easy but there are a few factors you should consider. Pick a tree that will thrive in your area. To get started, look up your climate zone and see which conifers grow best there. Once you’ve picked a tree and brought it home, leave it in a sheltered area such as under a covered porch or a larger tree canopy to help the tree adjust to a change in environment. Hose the tree down once and shake off any loose needles before bringing it indoors. Leave the tree in the container you purchased it in for the first few months. You don’t want to combine transplanting shock with taking the tree indoors. If the container isn’t all that pretty, drop it into a larger glazed ceramic pot or metal bucket for the holidays. If you pick one without a drainage hole, the container can also catch excess water. Living trees are happiest with cool temperatures and bright, outdoor light. Bring your tree indoors for no longer than 10 day stretches and choose a sunny spot away from any heat vents. You can also place your tree outside your doorstep for a few days to give it a break from the heat and limited light indoors. Potted trees indoors will dry out more quickly than those in your garden. Water daily and top-dress the soil with some mulch or reindeer moss (pictured above) to help prevent water loss through evaporation. One easy way to water your tree is to empty several trays of ice cubes on top of the soil. The ice will melt slowly so that roots can absorb the water before it puddles. After the holidays, take your tree outside and place it, once again, in a sheltered location. Water it well, soaking the root ball. After a week, move the tree in it’s container to a sunny spot in your garden where it can live for the rest of the year. When you see signs of new growth in spring, give the tree a dose of fertilizer according to the box instructions. If you’ve had your tree for multiple seasons or you start seeing signs of distress (yellowing needles, stunted growth, or sparsely-needled branches), it’s time to repot your tree in a larger container. For particularly root bound trees, you may want to cut 2-3 inches off the bottom and sides of the rootball using pruning shears or an old knife. When repotting, mix in a handful of controlled-release organic fertilizer with your potting soil to promote new growth. If you’ve had your living tree for years, at some point the tree will grow too large to be easily moved indoors. Trees over 6 feet tall with heavy root balls are close to the cut-off line. At this point, plant your tree out in the garden where it will get plenty of sun. If you don’t have room for a conifer, check with your city for tree donation programs to public parks. For more tips about choosing and caring for a living Christmas tree, check out the full article in our December issue of Sunset.